It’s often hard to explain what I ‘do’ here at Guinebor II Hospital. My role has changed a lot since I arrived and I’m not just responsible for the pharmacy. I have a myriad of other roles too, that are required in order to keep the place functioning. My American colleagues are currently on a break in the States and so a bit more than normal falls to me right now. 6.45am – staff prayer/devotion time. 7am – I’d already planned to speak with Michaela, a recently arrived short-termer, working part time at the hospital with her husband. I asked Michaela if she could give me 15 minutes to catch up with Kalbassou, acting hospital director, before his busy day starts. 7.15am – Patrice, triage technician, comes up to me while I’m talking with Kalbassou, to say a patient has arrived who has been sent for an outpatient consultation with Kalbassou by a mission worker from another organisation in N’Djamena. I’d already been informed that this patient was coming this morning. I was to pay all his fees and the mission worker in town would reimburse me. I go and find the patient and sort out paying his consultation fees. I apologise to Michaela who, fortunately, is very easy going and goes off to do another task. 7.30am – While helping the patient through the triage/payment process in the outpatient area, I notice the pharmacy isn’t yet open. I spot the staff member due to start work at 7am. I ask why she’s late. 7.45am – I go to find Michaela. Alphonse, our hospital-employed handyman, stops me on my way. We’re having serious problems with the pit latrines that the patients use (I won’t go into too many details!). Many patients shove empty plastic bottles and nappies down the hole into the pit, rather than putting them in the bins provided, and the pit is now full of all of this stuff. Meaning that the general level in the pit is high. This is causing problems with the plumbing in another area of the hospital. All the bottles and nappies need removing from the pit. Alphonse has found someone who is willing to do this job. We have to pay him well to do it, which is fair enough. I chat with Alphonse about the price, and we both go and tell Allain, our administrator, what’s going on with the pit latrines. 8am – I go to find Michaela again. I spot her and we start walking to a quiet area to chat. I’m stopped on the way by Matthieu, one of our physio’s. He says we’re running out of the locally-made wooden crutches and please could he order 95 pairs?! I suggest that 95 pairs is a bit excessive and where would we store them all? After ten minutes of discussion about the cost of making the crutches, how much we ask patients to pay for them, how much the patient gets reimbursed if they bring them back in a useable state once they’re done with them, and how many pairs we actually do need to order at the moment, he agrees to go away and think about how many pairs we actually need to order of which size. 8.20am – Michaela and I finally get chance to chat and catch up about hospitality for the three sets of short-termers arriving sequentially in July and August! And now for something that’s actually pharmacy related. Warning: don’t scroll down any further if you’re squeamish. This week we’ve had a visit from a maxillofacial surgeon from the USA. He’s been to Chad multiple times before. He did an outpatient clinic on Saturday morning and I went to sit in on it. Not thinking that I’d need to use my pharmacy skills. A couple bring in their 3 month old girl who has a growth on her face, right around her left eye and on her cheek. This couple has travelled from the Lake Chad region to seek treatment for their baby. That’s a long way, on terrible roads that aren’t really roads (Google a map of Chad if you’re interested!). 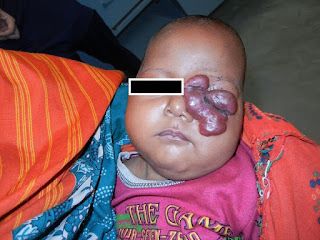 The surgeon knew straight away that this was a haemangioma and that it’s not treated by surgery but by a drug. Cue some searching to find the drug and dose – propranolol 1mg/kg/day. Here’s where I came in, everyone was looking at me! Propranolol is available in Chad but unfortunately we didn’t have any (a long story I won’t go into). So the baby was given a prescription and the father was asked to go and find it in a pharmacy in town. We see some other patients and little over an hour later the father is back. Good news: he’s found and bought propranolol. Bad news: it’s 40mg tablets. Pharmacy and medical people among you are probably wondering ‘why didn’t they prescribe a liquid?’ We can’t get propranolol in anything other than 40mg tablets here in Chad. The surgeon and some others were now turning the sorting of this out over to me. Patient weighs 4kg. So she needs 4mg per day. We decide two divided doses will be fine. Ok, so those who are quick with maths will be thinking – chop the tablets into 10! Yes! However they are round and about 1cm in diameter. Fortunately in the pharmacy we have a pill splitter that I brought back from the UK. Also fortunately, the tablets were scored into four parts. I decide (with agreement from the surgeon) that I’ll chop the tablets into 8. So that the child gets 5mg per day if they take one piece per day, half of it in the morning and half of it in the evening. I reasoned that by the time the Mum has ground the tiny shard of tablet down to get it into the baby, some will go astray anyway and the baby wouldn’t actually get 5mg per day. They are due back for follow up in a month. Hopefully they’ll come back. This kind of ‘thinking out of the box’ and ‘making the best of the situation in hand’ is typical of my life here in Chad. Trying to help people with the little resources available to them and us.